Internal medicine careers are in high demand, with plenty of opportunities thanks to an internist shortage in America. Today we’ll explore the path to becoming a doctor and what does an internist do. Our guest is Dr. Jeff Garland, an internal medicine doctor in suburban Chicago who has been one of my best friends since the age of 5. If you’re looking for medical jobs, you can expect many job openings for internists in the years to come. Internists, or primary care physicians, are the everyday doctors you go to who treat the full spectrum of illnesses that affect adults. While malpractice insurance rates rise and health insurance carriers create more red tape for doctors while squeezing their reimbursement income, medical students in growing numbers are choosing to work in the more lucrative subspecialties of medicine, helping to create the need and demand for more internal medicine careers. 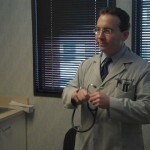 Dr. Jeff walks us through the many steps to becoming a doctor in today’s episode, taking us from the selection of science classes in high school through choosing a college major, taking the MCAT, selecting a medical school, applying to medical school, getting in to medical school, going to a 4-year med school, selecting a practice focus, the 3-year residency phase where you develop your confidence, finding employment, a typical day including what does an internist do, the lifestyle of being an internist and income potential for internists. He explains the best personality type, skill set, the biggest challenges and the new trends in internal medicine careers including hospitalists and “going boutique” or concierge medicine. Be sure to check out our Medical Career Resources which include helpful book and website recommendations. Careers Out There Host Marc Luber: Hey – what’s up everyone – welcome to Careers Out There. I’m your host Marc Luber and we are helping you find a career that fits you! Today’s career is something you guys can all relate to, b/c you’ve all been to the doctor – and we’re gonna be talking to a doctor – an internist – you know, a primary care physician. Even if you’re not looking to be a doctor, today should be interesting for you b/c we’re going to learn the behind the scenes – what it’s like to be an internist. We’ll hear about a typical day, the biggest challenges and the development of the career path starting from your high school science classes to the point where you’re deciding whether to join a big hospital group, go into private practice or even open your office and build a business. Our guest is Dr. Jeff Garland, who has offices in Grayslake, Illinois and Highland Park, Illinois. He happens to be one of my best friends since we were 5 years old. That’s like – almost 22 years ago! So I hope you learn a lot from the video – let us know – share your feedback in the comments section below the video. We want to make sure we’re getting you the information you need so you can decide if this path is for you. Alright – let’s meet Dr. Jeff. Hey everybody we’re here in Chicago where tonight it’s going to be 3 below zero, so for those of you wondering why I live in Los Angeles, there you go. Dr. Garland, thank you so much for joining us today. Internal Medicine Doctor Jeff Garland: I hope you brought a jacket. Luber: Yes, definitely. Jacket, 2 shirts, sweater. There’s so many careers out there, you’ve chosen to be an internist. I think most of us know what a doctor knows, we all go to the doctor – we’ve been going to the doc tor our whole lives – at least you all should be – so what we don’t know is a typical day. Walk us through a typical day for an internist. Dr. Jeff Garland: First of all, an internist is an adult doctor – a physician for people over 18 years old. A typical day: it’s kind of like a triathalon. The first part – is like the swim – is going to the hospital. So you go the hospital – some doctors go to 1 hospital, some go to 2 – and you see your patients and you reassess how they’re doing. Can they go home? Do they need a new test or a new antibiotic? How are they doing? So you evaluate them, you listen to their symptoms, review the data and then you make decisions. After that, you get to converse with other physicians. Then after that you go to your office. That’s the second leg – kind of like the run – or the bike – I don’t really run triathalons, I don’t really know how it goes. So we can call it the bike. So that part is – patients come to your office with their medical problems. A lot of them have blood pressure, cholesterol, diabetes, back pain, sinus infection, come for their physical, and you listen to their problems, try to put them on the right medications and some of them just need someone to listen to them, others need treatments. During the day there’s a lot of interruptions – the hospital calling, the pharmacy calling, other doctors calling. And then after that – the run – you review all of your paperwork, which can be lab results, cat scan results, mammogram results, x-rays and a lot of them you have to call the patients saying you need another test or your test is OK.
And then you can go home and hopefully you won’t have to go back. Luber: What’s the most rewarding part of it all? The most fun part and the most rewarding part. Dr. Garland: I think the most rewarding part is probably being able to get involved with people’s lives. You are a part of hundreds, perhaps thousands, of people’s lives. You know them, you know about their family, you know about good things that happen to them and bad things that happen to them. Just being a part of people’s lives, learning about what they do for a living, what their life is like is very interesting. So that’s probably the most rewarding. I guess the funnest part is just being with the people. Dr. Garland: Interacting. The worst part is every once in a while someone gets a disease that’s very bad – you know, cancer or something really terrible, and it’s hard to tell them there’s something bad. Luber: Yeah, how do you handle that? Dr. Garland: You know, a lot of times when you see a bad result: elevated PSA, abnormal mammogram, it’s the one that sits on your desk an extra day or 2, because it’s hard to tell them bad news. But I think you have to have the mindset that you didn’t cause the PSA to be elevated or the lung cancer or the breast cancer, but you’re the one that found it. And they probably had it for a couple weeks before you found it. They’re really the same person, they just – now we have more information – and the goal is to help them. I think when I first started sometimes I would get kind of a little bit petrified if I would have to tell someone bad news and I like them and it’s going to be hard. But now, I don’t enjoy it all, it is painful, but I feel like this is – I ordered the test for a reason and I wanted a good result but if there’s a bad result we have to deal with it. So I just try to get myself to call them and get them on the right course. They need to see a surgeon, they need to call an oncologist, where do we go from here? It is hard to see when people die or when they’re about to die and the family afterward. You know, it’s difficult for anyone, but it’s particularly difficult if someone is in their 30s or 40s, a younger person. That can be very hard. Fortunately, that rarely happens. But it can be really difficult. Luber: We’ll get to challenges of the job later but would you say that’s one of the top ones? Dr. Garland: I think it’s difficult but I think the bigger challenge is to deal with all the results and all the phone calls, all the information coming at you and keeping a level head and making sure you’re making wise decisions and don’t get overwhelmed. Luber: Humor me for a second with this. As I was driving over, I was thinking about parallels between what I’ve done professionally and what you’ve done with your career. And to me, it seems like intimacy is something in common with both. As a recruiter – as an executive recruiter for attorneys – I would deal with people and their careers. They would tell me what they want out of life, what work means to them, what they want to change in that so that I can help them get the life that they want. That’s a very intimate thing that you don’t always share with everybody and that’s the kind of information I would get from people. It helped me enjoy my job. I liked that kind of give and take. With you, they’re getting naked for you – they’re telling you the most private things about their lives. They’re sharing with you – and they’re naked doing it. What role does that play in your career and does that give you a higher level of appreciation for what you do? Dr. Garland: First of all, most of the time they have their clothes on. And usually when you’re talking about their private life and so forth, they have their clothes on. To maintain their privacy and their respect, you try to minimize the amount of time that they are potentially uncomfortable. So what you do is talk to them when they’re fully dressed, and then when it’s time for them to get undressed, you make sure they have robes and sheets and things covered and it’s done in a professional way. As far as talking to them about their private life, sometimes you can help someone immensely that they are so stressed out about something that they kind of feel like they’re the only person that has this problem. If you can listen to their problem and give advice, sometimes you can really help them – just by listening. You know, the other thing is that a lot of times, you know, people have blood pressure, cholesterol, diabetes, that you can give them a medication but if they exercise, eat right and lose weight, you can help their blood pressure, their cholesterol, their diabetes, their anxiety, their heartburn, their sleep apnea, without any medication. So a lot of people can really benefit from just a better lifestyle. Back to intimacy, I mean that is definitely the most rewarding: hearing about people. It doesn’t have to be something like someone is having an affair. It just could be someone concerned about a child, someone concerned about their mom, or someone worried about their work situation and then you see them the next time and they haven’t had a job for a long time and now they have one, or their mom was really ill and now they’re OK, and so forth. Luber: You touched on another thing that I think is a parallel and that’s listening. In sales, the most important thing is being a good listener and recruiting is a kind of sales. It seems like the same in medicine. You really have to listen to what the patient says. Dr. Garland: Someone did a study that says most doctors make the decision of what they’re going to do with a patient after 45 seconds, which is kind of frightening. I think that guy wrote that book BLINK [Malcolm Gladwell] about things like that, about how people make decisions real quick. But the listening to the patient, sometimes you’ll be at the end of the visit, and you ask one more question and then they say something that changes everything. So listening is a big part of the job: listening to the symptoms, listening to their concerns, can make a big difference. Luber: So to be an internist, you have to graduate from high school, college and med school and go through a residency program. Kind of walk us through some of that and tell us how that all plays out. Dr. Garland: The key is you have to jump on science classes right away and take the science courses in high school, get to college, and then you take the pre-med courses – usually pre-med people are biology majors or chemistry or something like that – but you don’t have to be. Then you have to take the MCAT. So you have to study, study…a lot of times I studied long hours. But I think one thing you have to do – you have to enjoy the content of the material – that it really is interesting – and you have to really exert your energy and put yourself out there to really try to learn your best. Then, usually you study with other people that are pre-med and a lot of people are not cut-throat but they call them gunners – they’re trying really hard to do better than everyone. You have to not be intimidated by these people because a lot of them can do effort for a semester or 2 but can they do a semester year after year, can they have the determination and the effort year after year. So you have to have a lot of determination. After you take the MCAT and get into medical school, it’s a 4 year medical school. You CAN go into the work force with a different type of job and THEN decide to be pre-med and just take 1 ½ years of pre-med courses and take the MCAT. So you CAN decide to become a doctor later in life – but it is easier if you start from the beginning in high school. You CAN go to a 6-year medical program: Northwestern has one, University of Missouri –Kansas City has one – they’re called 6 year medical programs where you get the undergrad and the med school all at once. They’re very hard to get into. And maybe you think you want to be a doctor but then you find out you don’t. With these, you’re on the course – you’re in medical school during undergrad! It saves 2 years, but you might miss the undergrad experience, which a lot of people would say is very important. So for regular med school, the first 2 years is a lot of book work: anatomy, physiology, biochemistry, a lot of studying. Then you take a boards test and you go into these clinical years where every 2 months you’re doing something else: you’re doing pediatrics for 2 months, you’re doing orthopedics for 2 months, you’re doing surgery for 2 months. So you kind of get to see all these different things and it’s good because you can kind of figure out what kind of fits your abilities and personality. And then around the last year you have to pick what residency you want to go into: surgery, orthopedics, internal medicine, radiology, anesthesiology, emergency room. So you kind of pick your specialty and your career and then you have to apply for residencies. Finally, when you get to internship and residency, you actually know something and you’re really learning what to do, you’re making decisions and you’re getting paid $35,000 a year, and you really have the name Doctor, not that that’s important but you feel like you’re actually getting somewhere as far as your abilities and so forth. I got admitted to internal medicine. It’s 1 year of internship where you’re kind of more like kind of a – they call them scutmonkeys – where you have to get all the labs and get all the information and be kind of in charge of all these patients but you’re not really the person in charge, you’re kind of relaying the information to some more senior resident. Then you have 2 more years of residency where you really learn more about in-hospital medicine, which is kind of ironic. Your training is 90% in-hospital medicine, and then when you become an internist, 90% of what you do is out-patient medicine. So the out-patient medicine, when you come out, you’re a little bit rocky because you really don’t have that much experience. But you’re very good at in-patient medicine, which is a much smaller part of your job. Then you either go into a specialty or you look for a job. It’s kind of like an elevator going up – you’re on the 11th floor – should you go up to 14th, 15th or should you get off and be an internist. I got off. And I think one of the reasons I did was because as an internist, you see everything. You see the common stuff, you see rare diseases, we’ve had a patient with limbic encephalitis, with all sorts of different diseases, blastomycosis, a lot of rare, different diseases, and we see a lot of common stuff, you get to deal with people. If you become a specialist, a lot of times you deal with the same problems, the same 3 problems: congestive heart failure, arrhythmias, and heart disease. Or GI bleeds, colon polyps and inflammatory bowel disease. Luber: So the variety keeps it fun. Dr. Garland: The variety keeps it fun. You know a lot about a lot of different things, but you’re not an expert in anything. So you have to know when you should be doing decisions and prescribing the medications and when you should refer to a specialist because this person needs an expertise that you don’t have. Luber: Great. Let’s talk money. What can someone make today as an internist? Dr. Garland: In internal medicine, there’s a lot of opportunity. All of the economic people say that there’s too many specialists and not enough internists, family practice doctors and pediatricians. Especially in rural areas and inner-city – they need internists very badly. So there’s plenty of jobs because there’s so many people who need an internist and there’s not enough of them. However, there’s different types of jobs: you could work at a university setting where you do research or you teach people and you don’t see patients that often, usually you don’t get paid that well. Or you could be in a private practice setting. Or you could work in big hospital systems. There’s different types of jobs. The median salary for an internal medicine doctor is $150,000. That factors in doctors in rural areas, inner-city and academics who probably make a little bit less and then people in private practice who probably make a little bit more. In private practice, most of the time doctors start out at $110,000 or $120,000 but it can get into the $200,000s if you’re willing to work hard and see a lot of patients. Internal medicine doctors making $500,000 or more usually have a lot of doctors working under them and they’re making a profit off all those doctors. This has been done in the past but it’s harder to do today because there’s so much opportunity that not that many internists want to work under someone and not be an equal. Luber: How would you say your pay compares from the beginning, from the early days as you advance through your career? Dr. Garland: The key to making more money as an internal medicine doctor is to see more patients. We’re not plastic surgeons, we don’t have nose jobs or implants. We’re not GI where you have colonoscopies and procedures, or cardiologists where you have angiograms or opthomologists where you have cataracs. We don’t get paid very much money per encounter, so you have to have a lot of different encounters. So it’s mostly you have to see a large volume of patients. Some internists can only see 10 patients because they can’t really move fast. So to do well as an internist, you have to be able to see patients quickly but give them the attention and make them feel like you are spending a lot of time with them because you’re really focused on them and care about their problems. But really going room to room, not coming back to your office and sitting at your desk. If you can see 20 patients a day, you can do much better than if you can see 10. Some of that takes time to build up your speed, but other people it’s just in their personality. Some people just can’t do that and other people can see a lot of patients and do a good job. Luber: Ok, so someone is new to this and they’re making their entry level money. How do they then grow over time financially? Dr. Garland: You can keep growing your practice, but at some point, if you have too many patients, your quality will probably go down because appointments will get too short or you’re getting a million interruptions because people are calling, the hospital is calling. A lot of doctors if they get too busy will close their practice and try to let their partners or their young associates get more of the new business. Some doctors are going boutique, and this is a form of internal medicine where someone is going to pay you $2,000 a year to be their doctor. I have not done that but it’s becoming more popular as medicine is changing and there’s more nurse practitioners and physician assistants. Some patients want more personalized attention, more time, not to be rushed, and because of this, there are doctors in big cities, in Florida and big cities, that have gone to boutique medicine, and they’re going to spend more time with their patients, but their patients pay a yearly fee. There’s a lot of doctors around here that are doing that and they find it rewarding. But there’s different pressures. There’s a big pressure: are all these people going to sign up next year, are they all going to send me this check for $2,000 or are they going to decide it’s not worth it to them. So they have that pressure…That’s one of the new careers in internal medicine. The other new career would be a hospitalist. A hospitalist is a person who just stays at the hospital, sees patients in the hospital, they don’t really have their own patients as an outpatient. In my practice, we still go to the hospital, we see our own patients, our patients appreciate that. But a lot of physicians feel like why go to the hospital – it’s not cost effective – let the hospitalists see them because they’re there all day. About half the patients now are seen by hospitalists – this is a new trend in medicine. Some of the patients like it, a lot of them don’t. The hospital kind of likes it because the hospitalists have a little bit better record as far as discharging patients faster, sometimes they order more tests because they don’t know the patients as well. But it’s hard for me to accept that I’m going to see someone 20 times over the course of 10 years and then when they really are sick, I’m going to let someone else see them? I think a lot of the patients wouldn’t like that. Luber: Alright – so tell me, what is the best personality type for being an internist? Dr. Garland: I like talking to people, so I get to talk to 20 different people a day and hear about their life and their medical problems. But if you don’t like to talk to people, then it’s probably not the right field for you. The three qualities you need are the three A’s: Ability, Affability and Availability. Ability is important, but it probably is only 1/3 of what you need to be successful. A lot of times the patients don’t know who is a good internist or not. There are some internists that really make poor decisions, don’t really know what they’re doing, use the wrong medications, but they have this big personality and the patients love them. So affability is very important too. It’s at least 1/3 of you being successful, is your personality. 1/3 is ability and of course ability is very important, but affability is equally important and so is availability. Someone could have a good personality and know a lot but if someone calls and the receptionist says “he can see you in 6 weeks” and they have a problem right now, they’re not going to end up being successful. Or if they refuse to squeeze people in, or if they’re always on vacation, or they’re never available, this is going to hurt their chance of being successful. So the ability to be available, also the ability to really connect with people as far as personality is very important. And ability of course – knowledge. Those are the 3 things. But if you don’t like talking to people then this isn’t for you. One thing I really recommend about medicine is that if someone is a real people person, internal medicine, pediatrics, could all be wonderful things, family practice. But if you are very smart but don’t really like people, you could be a radiologist or a pathologist where you don’t have to talk to anyone. Or if you’re very good with your hands: good with fine motor skills and making models and good at art and things like that, maybe a surgeon, you’d be a good surgeon. So different abilities lend themselves to different aspects of different careers in medicine. In internal medicine, kind of not being intimidated by not having an expertise in an area is important: that you can handle all these different areas and feel comfortable. Luber: What are the skills that someone really needs to have to be a good internist? Dr. Garland: I think the skills that count for making a good internist are perseverance and multitasking. A lot of times you get all these test results and if you don’t read these reports carefully, sometimes they’ll say “oh, there’s a lung nodule on the cat scan of the ab area”. You were looking for abdominal pain, but it’s a lung nodule. Recheck the catscan in 6 months. Well if you don’t read the report very carefully, you might miss that. So being very careful. Also, if you change a medication, you might need to check their blood work in a month. Some doctors might just say come back in a year. It’s important to, even if the chances of problems with the medication are very low, to be very diligent. It’s a quality that’s very important. The other is multitasking. You can be in with a patient and get 2 phone calls interrupting from the hospital and you have all these people coming at you as far as phone calls from the hospital…So multitasking is very important – you can be in the middle of something and get interrupted – there’s tons of interruptions – the pharmacy is calling, the hospital is calling, other doctors are calling, and they’re calling about a patient that’s not the one you’re seeing. So you have to switch from the patient you’re seeing to the patient they’re calling about. You have to be very careful that everything is accurate. So sometimes it’s important to step out of the room – you can’t say someone’s name while you’re in the room because there’s privacy concerns – HIPAA violations. So a lot of times someone calls about a patient, you say yes yes, do this do that, but if you have to say their name, you should walk outside of the room because there’s privacy concerns. Luber: What would you say the lifestyle is like? Is it long days? Is it high stress? Is there a work life balance? Dr. Garland: I think lifestyle is very dependent on what job you have. A hospitalist is more like an ER doctor where they have shifts. When they’re on, they’re on. When they’re home, they don’t have to really think about it. There are some internists that will only see patients in their office – that’s an easier lifestyle. They go home, they don’t have to worry about the hospital calling, the emergency room calling. There are some disadvantages to that too: that you really are not doing the whole job – you’re doing outpatient. So over time, you might lose some skills because you’re not in the hospital, you’re not interacting with other doctors, you’re not ordering the tests, you’re not talking to the doctors while the patient is in the hospital so when they get out of the hospital, you don’t really know what happened to them as well. You really weren’t there, you didn’t order the tests. So over time, if you’re just a doctor in your office, you might not even know your specialist colleagues because you’re just in your office. So going to the hospital definitely adds to your experience level and to your knowledge but it worsens your lifestyle because those are the times you have to go in at night, or you have to go to the hospital, you have to go back to the hospital. So if you want to just be an outpatient internist, your lifestyle is going to be easier. When I was in medical school, I went to a dermatologist for a skin issue and I saw this doctor who was very nice, he worse double glasses, one was probably magnifying glasses. He took off his magnifying glasses and he said, “Jeff –when you get to be 40 years old, there are 2 types of doctors: dermatologists and those who wish they were dermatologists.” And the reason he said that I think was because he’s very satisfied with being a dermatologist himself. But they have a very good lifestyle: a derm emergency might be less than once a year and they work very hard when they’re in their office but once they go home, they go home. Internal medicine is not like that. You have people in the hospital, people in the emergency room, nurses calling, there’s a lot of interruptions into your private life. Some people enjoy that, some people don’t, but it’s one of the things that the more you put into it, the more the reward. Currently, I’m in with 2 other doctors, so I’m on call every 3rd weekend. And every 3rd week night. I’m the one who has to answer the phone. You could be in a bigger group where you could be on every 10th weekend or every 12th weekend. Usually if you are in a big group, you go to the hospital and there’s 20 people where with our group you go to the hospital and there’s 6 or 7. Luber: Tell us what it means to be on call. Dr. Garland: On call means you have a pager and if one of the patients of the practice has a problem like chest pain, they call the page operator and the page operator calls you and you have to answer the phone. “Go to the emergency room”, “take an antibiotic”, “see me tomorrow” – you have to give the advice to these people. Other times, the emergency room calls, we have your patient, they have pneumonia, they’re having a heart attack, should we call cardiology, what should we do. Other times you get phone calls from the nurse: this patient looks bad, their blood pressure is low, they’re having pain. You have to answer these questions. Their blood sugar is high. So you have to be ready to answer questions from all these different people. Sometimes, when you’re on call, on Saturday you go to your office and you see patients in the office, maybe 10-15 patients and you have to go to the hospital. Then after you’re done with the hospital, if there’s any problems, people page you. Occasionally after 10:00 you’ll get calls, and sometimes it’s hard to wake up. You were sleeping pretty soundly and the pager goes off, and sometimes when you wake up, it’s definitely hard to focus on what the emergency room doctor is saying because you were sleeping 5 seconds ago – it’s very difficult. But you do your best. If for some reason, you don’t answer your pager, they call you back. And sometimes your wife gets upset because she gets woken up by the disruption, but it’s not the worst thing. Of course, you don’t want to be paged in the middle of the night, but it’s part of the job. – but there’s some practices where you don’t take any call because they don’t do in-patient medicine, or if you’re on call it’s much less intensive. Luber: Is there a work life balance? Dr. Garland: You definitely can have a balance, but I think it takes effort. You can get more and more patients, and just work work work, but I think it also takes some effort to say enough is enough. Maybe we need to hire another doctor so I’m not overloaded, or maybe I have to take no new patients. There are measures you can take. Maybe instead of ending at 5, I’m going to end at 4. There are measures you can take to control your lifestyle. A lot of the people that are in internal medicine have trouble with that. But it is important that if you just work yourself into the ground, you might make yourself worn out to the point where your decision making is bad. It’s important to protect yourself for your family and for your own mental well-being. Luber: So, what would you say is the biggest challenge of being an internist? Let’s weed out some people right now. If you can’t handle this, then you shouldn’t be an internist. What would you say? Dr. Garland: There’s a lot of great things about being an internal medicine doctor, but if you’re scared of blood, it’s a little difficult getting through med school and the residency, but you probably can be an internal medicine doctor because you’re not a surgeon – you’re not dealing with blood, your hands aren’t in someone’s abdominal wall, you’re not cutting into, you still can get by. There are definitely fields like psychiatry where you don’t have to deal with blood at all. I think if you are going to fall apart if something bad happens, then it’s probably not for you. There are going to be some bad diagnoses, bad diseases, things you’re going to have to tell people, you have cancer, you just lost your loved one, you have a disease that there’s no good treatment for, and it’s not easy. So I think that that can be difficult for a lot of people…and if you can’t handle those things, then this might not be a good career for you. Physicians do get sued, and I think you know, you’re making a lot of decisions on a lot of different people, and not everyone is going to have a good outcome. There is always the potential that someone could sue you, and I think the main thing to remember is that if you have a good relationship with the patients and they know you’re trying, and you’re diligent and really care about them, then you should be OK. But if you have this fear of being in that kind of situation, then that might be a reason that medicine might not be a good fit for you. As far as things that would make you be wary if this is the right career for you, everything you do you could harm someone. If you put in an IV, you can cause an infection that infects their heart valve. If you give them an antibiotic, you can cause a diarrhea that could potentially kill them. If you give them Tylenol, it could cause them liver damage. If you give them Advil or Motrin, it could cause a bleeding ulcer. A lot of your decisions could have some complications and for some people that might be hard to take so sometimes doing less can be better. Everything you do you could actually cause more problems, so you’ve gotta be really careful. Luber: What about workplace environment, dress code, what would you say is appropriate? Dr. Garland: You know the old fashioned doctors wore a suit and a tie and a white coat or gray coat, and that was what they did. But those old fashioned doctors used to smoke. They didn’t know everything. Now a lot of doctors are wearing just khaki pants, just a dress shirt with no tie, a lot of doctors don’t even wear a lab coat. I like the lab coat. I think it gives you an aura of being a doctor. You put your stethoscope in it and your prescription pad, so I like wearing the coat. However, there are studies that say that the tie and lab coat harbor numerous germs. Ties are never washed and they really harbor a lot of germs and so do lab coats. Luber: Should I be washing my hands right now? Dr. Garland: No, you don’t have to wash your hands. But infectious disease societies kind of frown on ties and lab coats. However, if you dressed in blue jeans, you kind of give off this image like you were laying on your couch and you just came to the hospital. It doesn’t really give the aura that you want to achieve. Luber: I guess I’m not dressed to be a doctor today. So I’m watching this video, I’m out there somewhere, I’m in med school, and I’ve decided I want to be an internist and I want to work for you or I want to work for someone just like you. What should I do? How do I approach that? How do I find someone like you and hook up for a job? Dr. Garland: I think every city, in big cities there could be 50 hospitals. There’s tons of hospitals, even in rural areas, small cities have hospitals. And all the hospitals have 30, 40 internal medicine doctors. So you are in bigger demand than we are. Doctors used to make it really hard to be partner, or they had to pay a lot of money to be a partner or buy in. And now the tables have turned, where we need you more than you need us because there’s more of us than there are of you. So in internal medicine, you’re in a good position. Maybe in some specialties, there’s too many plastic surgeons, or there’s too many of certain specialties. But there’s definitely a shortage of internists, so you’re in the driver’s seat. Luber: Do I pick up the phone and just say “hey, what’s up, I want a job”? Or do I have to go through a recruiter? How does that work? Dr. Garland: I think what you need to do is you need to pick where you want to live and then you look at the hospitals and then you can look at all the internal medicine doctors and you could call them and say “are you looking”, “are you looking”? There’s people at hospitals who also take resumes and then spread them to practices that are looking. And then at residencies they have a career office where physicians write letters who are looking to the career offices at major residencies, so sometimes they know where jobs are available and then you can send your resume or CV and see and call. If you are interviewing for a job in internal medicine – especially in private practice – you know, there’s all these degrees, “I did this research” and all that stuff – the person that’s interviewing you wants to hear “I want to work hard, I want to be busy, I’ll do whatever it takes, I’m willing to work hard, I’ll work at night, I’ll do whatever it takes to be successful.” That sounds very cliché but it’s really what people want to hear. Luber: What made you choose to be an internist? And when did you make that decision? Dr. Garland: I think I decided to become a doctor at a very young age. My cousins, 2 were doctors, 1 emergency room and 1 podiatry and 2 were lawyers. And I think I kind of like wanted to follow in those footsteps. My uncle would say, “what are you gonna be- a doctor lawyer, a lawyer doctor, which one?” So maybe I felt the pressure, but for some reason that’s what I wanted to do. I decided when I was like 9 or 10 when I probably didn’t know that much about it at all. I kind of decided that that’s what I wanted to do. So I went to Deerfield High School in Deerfield, IL and took a lot of science courses and then I went to University of Illinois in Champaign-Urbana for undergrad and I was a biology major. After that I went to University of Illinois Med School in Chicago and I was there for 4 years and then went to Rush Presbyterian St. Luke’s Medical Center for residency. I really enjoyed the residency much more than the med school. If you have problems with med school as far as getting burnt out on so much studying, there is a light at the end of the tunnel, it does get rewarding and interesting and fun. I chose to go into internal medicine because I felt like it fit my skills as far as talking to people, being interested in people, caring about people, I felt it fit my abilities the best. I didn’t think I was a very good fine motor person so I didn’t think surgery would be good. It really fit my abilities the best. I didn’t want to go into a specialty. I flirted with infectious disease, but I decided that internal medicine was the right way to go. I chose to do a private practice – it just kind of happened. I interviewed at a bunch of places. I think in a private practice setting, you might work harder, there might be harder work, more call, but more rewarding. You actually get to decide what your hours are, or when it’s time to hire a doctor you kind of get to pick. Where if you work in a big hospital system, they tell you when you’re going to work, who your receptionist is going to be, who your lab tech is going to be, and who your next partner is going to be, so you definitely lose a lot of say as far as how things are going to go. I think it’s more rewarding to be in a situation where you have more control. If you work in a big group they can fire you – you don’t know what’s going to happen, but there’s less that you have to worry about in some ways. So for some people it might be good, but for someone who wants to be more in control, then private practice would be better. You might not be able to do as well financially the first couple years, but after a while you usually do better in a private setting. Luber: In addition to being an internist, you’re also an entrepreneur because you run your own practice. How would you say that that impacts your career? Dr. Garland: The first 8 years I practiced in a private practice setting where I was a partner. Then I decided to start my own practice about 4 1/2 -5 years ago. So it was definitely a learning experience. Most pre-med and medical people have no business education, so I really in a lot of ways didn’t know a lot of things. I might have been too optimistic. When you are running a business, there’s a lot of pressure as far as the bottom line: you have lab techs, receptionists, billers, an office manager, and everyone has to get paid every 2 weeks. If they don’t, they’re going to quit. So in the beginning, there might be some weeks or months where you can’t take a paycheck because everyone else has to. Also there’s a lot of start-up costs and then you have to hire physicians. Some of them may work out and some of them may not. Probably, it’s a 50-50 proposition. You can interview and really try your best, but it’s hard to know who is going to fit well, and work hard and really mesh with you. We had some people that didn’t work out the best and then, finally, I found 2 people that I really enjoy working with and they’re doing very well. One of them is a partner that is 50% equal with myself, which I’m completely fine with, and then we have another doctor who has been with us for 2 years and hopefully she will also be a partner soon too. I think, for me it’s important to bring them in as partners if they’re hard working and good physicians because then they’re going to want to stay and they’re kind of committed – they’re not just someone who comes and goes but they’re committed. That’s really what you need because it takes years to get busy and then once they get busy, you want them with you to build the thing up so it can support the office manager, the receptionist, the lab techs, the billers, so if you have more doctors, your percentage of the overhead is going to go down. So you want to find the people with similar goals, similar practice style; however not everyone is going to practice exactly the same way. There’s a lot of style in internal medicine. Different internists do things differently – they use different medications, and that’s OK – not everyone is going to do things the same. So you want to find things, you want them, there’s a certain standard that they have to meet up to but they might do things differently, and that’s OK.
Luber: So you love what you do? Dr. Garland: Absolutely. I enjoy it. Not every part of every job is going to be fun. There’s paper work, there’s bad news, but overall I enjoy coming to work every day. I enjoy my colleagues, I enjoy the patients and I enjoy being an internist. Absolutely. Luber: And now if I’m watching out there, I’m interested, I’m not yet in med school. What are some keys to success? Give everyone some keys to success to being an internist, so they can kind of have some guideposts to go by. Dr. Garland: I think you have to take the science courses and see if you can do well in them. Not everyone can. A lot of people can, but not everyone. So take the courses. Getting through the process is like a long journey. It seems like it’s never going to end. Test after test, finals after finals, the MCAT, boards, other boards…but eventually, one day you’re done. Along the way there could be a setback, you could get a C in a course, things might not always go your way, you might have to take the MCAT a second time, but if you’re determined, you can get through it. And then to be successful, a lot has to do with do you have the right personality? Do you like people? Do you like talking to people? Sometimes you’re the therapist for a lot of patients. A lot of people don’t see a psychiatrist or psychologist, they just are too busy, they don’t want to, the stigma. So a lot of people use you as that person who they want to talk to. Some people really enjoy that. I do. You get to hear a lot of stuff. You’re almost like the hairdresser. You know, they get to hear all the good stuff. So if you like hearing about people’s lives, if you enjoy people and sometimes a little bit of advice can help them more than anything. If you enjoy talking to people and socializing, it’s definitely a good job for you. A lot of people have jobs where they’re just at a desk all day, so this is great. You get to talk to people and be with people. Luber: Dr. Garland, thank you so much for joining us. Everybody out there at Careers Out There, real advice from real people like Dr. Jeff here. Thank you. Come back and watch us again some time soon. Thank you.